At the BFSS’s first ever Membership Conference held in London on 22 May 2015, the Chairman Professor Steve Hodkinson made clear that the Council would be seeking to engage the Society’s Members more actively. He also announced that Membership would be extended, on a pilot basis, to a small number of charities who had received at least three grants from BFSS. The Conference provided an opportunity to update Members on progress towards achieving the Society’s strategic priorities, especially its grant giving. Dr Ben Ramm, Chair of the Grants Committee, gave a presentation on the Society’s grant giving, highlighting the level of grants given in 2014 which, at just over £630,000, was the highest ever. 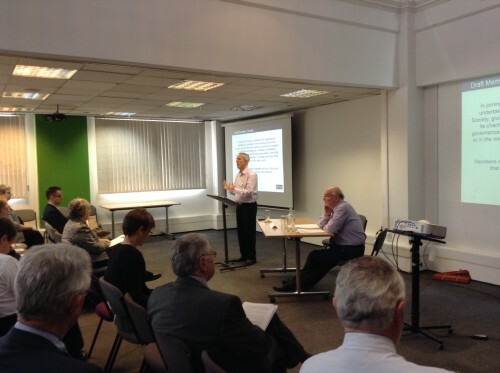 Both Professor Hodkinson and Dr Ramm answered a range of questions from Members. Guest speakers included Dr Paul Dornan, Senior Policy Officer at University of Oxford, Department for International Development, who presented ‘From infancy to adolescence: growing up in poverty’, part of the Young Lives study. This study followed nearly 12,000 children in 4 countries: Ethiopia; India (Andhra Pradesh & Telangana); Peru and Vietnam, over 15 years. Also speaking were Daan Gerretsen, Director of Programmes at Build Africa, and Sharath Jeevan, Founder & CEO at STIR. They talked about the key elements of their collaborative project to support Build Africa’s “Teacher Empowerment” project in rural Uganda, which BFSS is funding. The Members’ Conference was a successful event, judging by the feedback, with 69% of respondents rating it as very or extremely effective and a further 23% as effective in meeting its objectives. Members very much appreciated the valuable opportunity to meet each other and to meet Trustees. To read more about the Conference please click here Report on BFSS Membership Conference 22 May 2015.